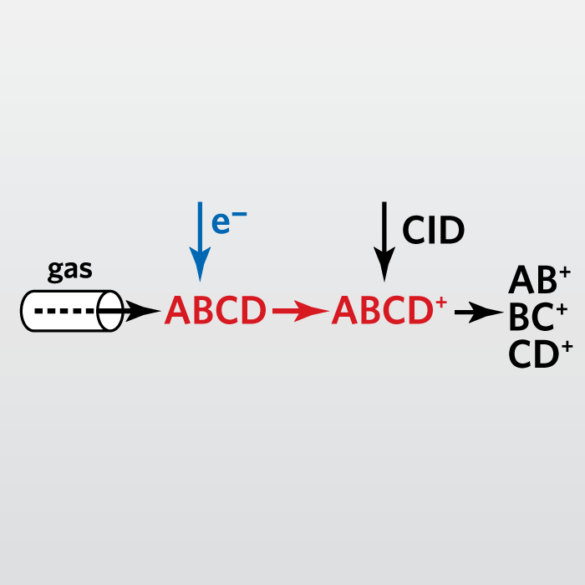 In an identical manner to Gas Chromatography, samples being analyzed by GC-MS/MS are separated in a gaseous state based on the various physical and chemical properties of analytes of interest and their interaction with the analytical column’s stationary phase. Upon exiting the analytical column the analytes enter the tandem mass spectrometer (MS/MS) which consists of two scanning mass analyzers separated by a collision cell. Fragments selected in the first analyzer are reacted with an inert gas in the collision cell, resulting in further fragmentation. These daughter product ions are then resolved in the third quadrupole for analysis. GC-MS/MS analysis can be performed on liquids, gases or solids. For liquids, the sample is directly injected into the GC. For gases, gastight syringes are used to transfer the gaseous components directly into the GC. For solids, the analysis is carried out either by solvent extraction, outgassing or pyrolysis analysis. The analytes of interest are then quantified through comparison to external or internal standards. In addition to the quantification, GC-MS/MS is well suited for the identification of unknown volatile components using the mass fragmentation patterns and mass transitions associated with the unknown analyte.